Items are displayed in this list when you have been assigned tasks for that item. To open an item that has an assigned task for you: Right-click the list row, and select Open Item from the context menu. Or, double-click the item on the Tasks list. 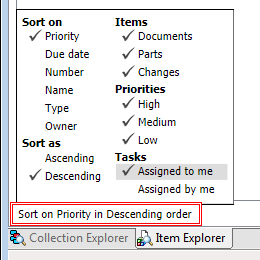 To adjust what tasks are displayed and their sort order: Click on the sorting notice at the bottom of the list, and set the options.